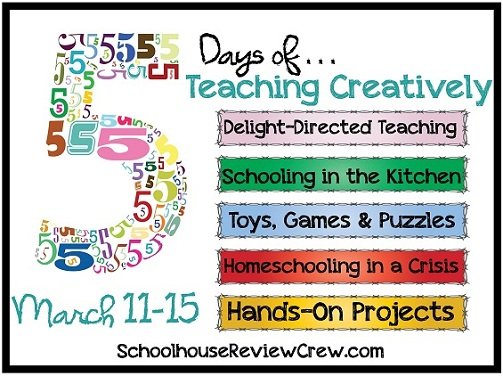 Today is day 3 of the Teaching Creatively Blog Hop! I hope you have been enjoying reading about our first 3 topics, Delight-Directed Teaching, Schooling in the Kitchen, and Toys, Games and Puzzles! This week, 80+ members of the Schoolhouse Review Crew are sharing their tips, ideas, and inspiration for bringing more creativity to homeschooling. Today, we are sharing about Homeschooling in a Crisis. Crises come is all shapes and sizes. From surgery to the death of a loved one, chronic pain to premature childbirth, job losses to moves across the country, many homeschool families find themselves in a situation they did not expect. These events can interrupt everything normal and usual in our lives, especially homeschooling. So what are we to do? Today, several of our Crew members, who have been in some of these exact situations will share with you how they homeschooled in a crisis. This is a blog hop, so that means when you’re finished reading one blog post, you will find the list of participating bloggers in a linky tool at the bottom of each post, making it easy to hop to the next blog article to read. Click on the banner below to read more . . .